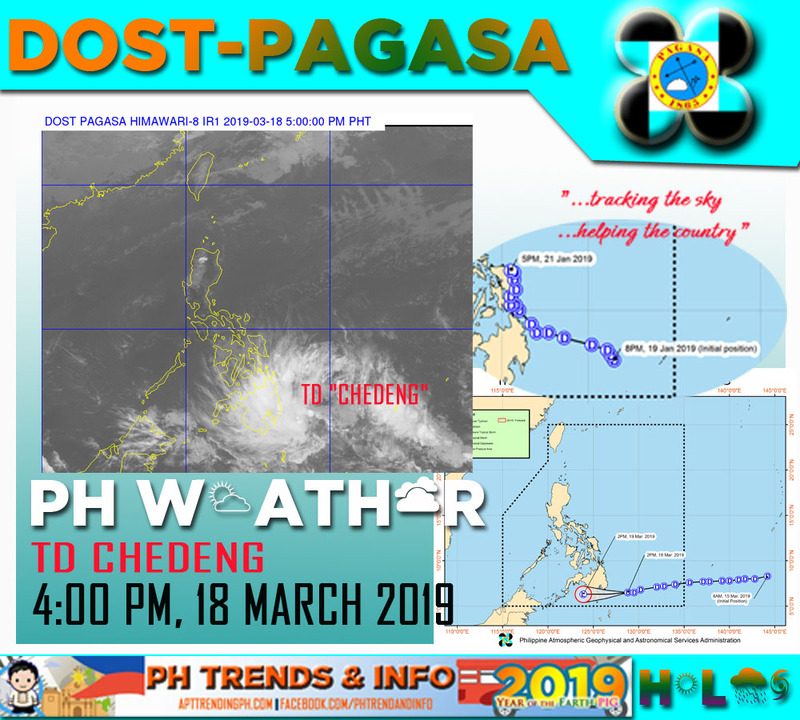 Home PAGASA PAGASA Weather Update for TD "CHEDENG" as of 5:00 PM 18 March 2019. PAGASA Weather Update for TD "CHEDENG" as of 5:00 PM 18 March 2019. Synopsis: At 3:00 PM today, the center of Tropical Depression "CHEDENG" was estimated based on all available data at 330 km East Southeast of Davao City (6.5oN, 128.5oE) with maximum sustained winds of 45 km/h near the center and gustiness up to 60 km/h. It is moving West Southwest at 20 km/h. Davao Region will experience Rains with gusty winds due to TD "Chedeng". Possible flash floods and landslides due to scattered to widespread moderate to heavy rains. Eastern and Central Visayas, Caraga, Northern Mindanao, SOCCSKARGEN, Bangsamoro, and Zamboanga Peninsula will experience Cloudy skies with scattered to widespread rains due to TD "Chedeng". Possible flash floods and landslides due to scattered to widespread moderate to heavy rains. Batanes, Cagayan, and Isabela will experience Partly cloudy to cloudy skies with isolated light rains due to Northeasterly Surface Windflow. No significant impact. Metro Manila and the rest of the country will experience Partly cloudy to cloudy skies with isolated rainshowers due to Localized Thunderstorms. Possible flash floods during severe thunderstorms. "CHEDENG" HAS SLIGHTLY SLOWED DOWN WHILE MOVING WESTWARD TOWARDS DAVAO ORIENTAL. Today (18 March), scattered to at times widespread moderate to heavy rains will prevail over Caraga and Davao Regions, especially over Surigao del Sur, Agusan del Sur, Davao Oriental, Davao del Norte and Compostela Valley. Tomorrow (19 March), scattered to at times widespread moderate to heavy rains may be experienced over most parts of Mindanao, especially over portions of Davao Region, SOCCSKSARGEN, Bangsamoro, and Zamboanga Peninsula. The disaster risk reduction and management offices concerned and residents of the aforementioned areas, especially those living in areas identified to be at high risk of flooding or landslide, are advised to undertake appropriate actions and continue monitoring for updates, including the Heavy Rainfall Warnings and Thunderstorm Advisories issued by PAGASA Regional Services Divisions. Those with small seacrafts are advised not to venture out over the eastern seaboards of Visayas and Mindanao, as well as the seaboards of areas under Tropical Cyclone Warning Signals (TCWS). CHEDENG may make landfall over the southeastern coast of Davao Oriental and / or the eastern coast of Davao Occidental tomorrow morning and will weaken into a Low Pressure Area while crossing Mindanao. Davao Oriental, Compostela Valley, Davao del Sur, Davao City, General Santos City, Davao Occidental, southern portion of Davao del Norte including Samal Island, eastern portion of North Cotabato, eastern portion of South Cotabato, eastern portion of Sarangani, and eastern portion of Sultan Kudarat. Information is courtesy of DOST PAGASA.